Laura Jane "Jennie" Minerd was born in 1874 at Maple Summit, Fayette County, PA, the daughter of Martha Emma "Matt" (Minerd) Gorsuch. She was the first known woman in our family to teach school in Fayette County, PA.
Jennie was raised by her grandparents, Charles and Adaline (Harbaugh) Minerd on their mountains farm in Maple Summit. Her parents never married, and her mother successfully sued the father for support the same year as Jennie's birth, a fact reported in the Sept. 17, 1874 Uniontown Genius of Liberty. Jennie's father was Charles Walter Shipley, the son of Levi and Catherine (Linderman) Shipley. In an ironic twist, Walter later married Jennie's cousin Mary Todd Jennings, of Victoria, Fayette County. Jennie and her children knew this fact, and it was innocuously published once in a local newspaper with her apparent consent. Yet her origins and maiden name were an understandable source of confusion in the family. Many years later, when her adult children died, their news obituaries gave her maiden name as "Minart" and "Gorshie" (a misspelling of "Gorsuch"). Jennie grew up with her younger first cousin, Ernest Earl Minerd, who also had been born to a single mother. Jennie and Ernest were close and were more like sister and brother. Education was very important in the family during Jennie's growing-up years. Her grandfather Charles Minerd and uncles Lawson Minerd and John K. Hall all served on local school boards during that period in her life. Jennie herself became a teacher and in 1892, at age 18, taught at the Egypt School in Stewart Township, near Ohio Pyle, Fayette County. At the age of 19, on Nov. 5, 1893, Jennie married 18-year-old Charles Jacob Williams (1875-1959), the son of Leroy and Hester Ann (Dean) Williams. The couple was wed in Fayette County. Charles was a native of Hancock County, OH but had grown up in Ohio Pyle. The Williamses had 11 children -- Grace Williams, Mabel Williams, Laura "Ruth" Moist, Charles Henry Williams, Marella Irene Carter, John Alvah Williams, Isabella Williams, William Edward Williams, Andrew Norris Williams, Estella Florence Robinette Hagerty Dixon and a baby son who died in infancy. As an indication of the tragically low survival rate of infants of that era, young daughters Grace and Mabel died of diphtheria, and daughter Isabella died of scarlet fever. The photo seen here is of Jennie with baby Isabella on her lap with son John and daughter Marella. Charles stands in the background at right, barely visible. The family made its home circa 1901 in Frostburg, Allegany County, MD where some of their children were born. They later returned to Stewart Township, Fayette County, where Charles was a woodsman, likely involved in the timber industry in the lumber-rich mountains. They made their home in Stewart in 1910, as shown by the census taken that year. Jennie's step-father Richard Mason Gorsuch brought the family much heartache over the years. In 1900, he robbed a store in Connellsville, and spent a year in jail in the Western Penitentiary in Pittsburgh. Five years later, after returning home, he left again and stayed away for seven years, living in a shanty in Vanderbilt, Fayette County. He disappeared for good in 1912, and was last seen at the railroad station in Ohio Pyle. More tragedy visited the Williamses often during the years. Jennie received word in 1916 that her brother Floyd had been killed in a coal mine cave-in; in 1926 that her brother Charles had died at age 45 in Rockwood, Somerset County; and in 1937 when her brother in law Frank Zearfoss also was killed in a coal mine collapse. Charles was a carpenter and contractor. He also eventually became proprietor of his own store for a time in Allenport, near Mt. Union, Huntingdon County, PA. They attended the Allenport Methodist Church. The federal census of 1920 lists the family in Mount Union, Huntingdon County, with Charles working as a foreman in a pen mill, and 16-year-old son Charles as a laborer in a tannery. 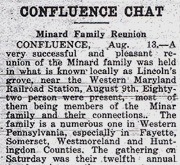 A very successful and pleasant reunion of the Minard family was held in what is known locally as Lincoln's grove, near the Western Maryland Railroad Station, August 9th. Eighty-two persons were present, most of them being members of the Minar [sic] family and their connections. The family is a numerous one in Western Pennsylvania, especially in Fayette, Somerset, Westmoreland and Huntingdon Counties. The gathering on Saturday was their twelfth annual reunion. Among those present were... Mrs. Hester Williams, Uniontown; ... Mr. and Mrs. F.G. Williams, Mount Union, Pa....."
Jennie and her family also attended the Minerd Reunions in 1929, 1930 and 1932. Each time, she wrote an article about the affair in the Huntingdon Daily News. Her data-gathering and reporting provide vital details of these early events and family connections that otherwise would be lost today. Charles and Jennie owned a camp where they spent their weekends. It was known as "Camp Laura Cottage" and was located at Hawn's Bridge, along the Raystown Lake reservoir in Huntingdon County, an early hydroelectric dam project. In addition to their adult children, the guests they entertained there were Mr. and Mrs. C.H. Carter and their children Irene, Edna and Robert; Mr. and Mrs. H.C. Miller; Charles' brother R.H. Williams and friend Judson Chilton of Chicago; R.R. Brandt; T.B. Cramer; Dan Baer; Earl Cornelius; Mr. and Mrs. Preston Buckley and daughter Virginia; Minnie Shenefelt; Mrs. Charles Hull and daughter Florine; Fred Hawkins; and others. In June 1930, they hosted an "old time barn dance" at the cottage. Said the Daily News, "The most interesting feature of the evening was presented by Miss Florine Hall when she danced "The taps" or "bugle call" and an acrobatic dance. The orchestra... entertained with very fine music and the people at Hawn's Bridge expressed the wish for them to return again that they may enjoy another evening with them." A few weeks later, in July 1930, while at camp searching for eggs in her henhouse, Laura discovered a large black snake. She grabbed a rifle from inside the cabin, and got off a shot at the snake's head, but missed. She then called for Charles, who killed the reptile. When measured, it stretched 6 feet, 4 inches long. When Charles' mother Hester Williams would visit after traveling from her home in Uniontown, Fayette County, Charles and Jennie made sure she felt welcomed. A February 1930 article in the Daily News said that they "delightfully entertained" her with a party "spent in social conversation and enjoying music. Mrs. F.S. Crawford played a number of selections on the piano and also sang The Holy City. Refreshments were served by the hostess." Hester enjoyed traveling, and in one week in May 1927 is known to have driven from Baltimore, MD to Allenport to Baltimore and thence to Jacksonville, FL. 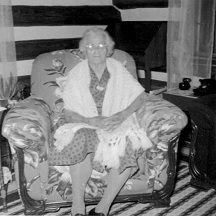 Jennie's mother often came for visits, and when she reached her 100th birthday in 1957, the Daily News said she "is well known in the Mount Union area because of relatives living here with whom she has visited many times..." In September and October 1931, Jennie hosted her aunt Almira Overholt for a three week's stay. After her children were grown, Jennie used her education to keep busy and generate some income. She served as the Allenport correspondent for the local newspaper, the Huntingdon Daily News, reporting on the gossipy comings and goings of neighbors in the community. Some but not all of her articles were bylined "Mrs. C.J. Williams, Cor." This may account for the wealth of Williams family news found in its pages -- a veritable chronological history of the family's social and work life for decades. The late 1920s brought health and financial hardships to the family. In the '20s, Charles owned a service station, lunch room and grocery store along the state road in Allenport. In his words, it was "doing a good business." But Jennie became seriously ill, and Charles was no longer able to handle the never-ending responsibilities of his family owned retail firm. In April 1929, he advertised in the Daily News that he was seeking to sell the property "on account of wife's illness." Later that year, in July 1929, Charles was employed at a stone quarry in Germany Valley. Laura paid him a visit in mid-July, and was allowed to press a button that ignited "the largest shot that has been put off, throwing out many tons of rock," said the Daily News. When the federal census was taken in 1930, the Williamses made their home in Shirley Township, Huntingdon County. That year, Charles made a living as a construction carpenter. Their married son and daughter in law, Charles H. and Emma Williams, resided next door. Their financial situation did not improve, and the onset of the lingering Great Depression of 1930s took a deeper toll. In August 1936, Charles secured employment in Dubois, Clearfield County, some 90 miles from home. But by June 1937, the Williamses were without any means to cover their debts, and were officially declared bankrupt. The case was assigned No. 9604 in federal bankruptcy court, with Howard L. Henderson of Huntingdon assigned to be referee in the matter and settle claims among their creditors. Laura and Charles celebrated their 50th wedding anniversary on Nov. 5, 1943. Their photograph and a prominent article were published in the Daily News. Many relatives and friends visited their home that day to offer congratulations -- with the exception of grandsons Charles Williams, Sherman Williams and Charles Moist, who were away serving in the military during World War II. Supper was held at the home of daughter Marella Carter, and the couple "received many attractive and useful gifts from their many friends as tokens of their affection for these fine folks wh ohave spent 50 years of happy married life together." They visited at the old schoolhouse where she attended school for ten years. [Son] C.H. Williams also attended the same school for some time. Across the road is the Church of God where they attended church and Sunday School 53 years ago. They attended the church service then in session. At Ohiopyle they made a short visit. C.J. Williams spent his boyhood days there and it was there that he and his wife began housekeeping. At Somerset they had dinner at home of Mrs. Zerfoss. They were accompanied home by Mrs. Gorsuch, after having traveled a distance of 300 miles. Despite her illness in the late 1920s, Jennie lived a long life. She died in 1952, at the age of 78. Charles outlived his wife by seven years. After a brief illness, he died on Dec. 14, 1959. Burial was in the Mount Union IOOF Cemetery. An obituary in the Daily News noted that he was survived by 22 grandchildren and 31 great-grandchildren. In 1997, our Minerd-Miner-Minor Reunion honored more than 220 educators in the family. Jennie and her accomplishment as the earliest known teacher in Fayette County were recognized in an article in the Greensburg Tribune-Review and also in our special reunion booklet, A Sense of Wonder. Daughter Florence Estella Williams (1899-1954) was born on Dec. 28, 1899 in Pennsylvania. She had a fifth grade education. Estella was married three times. Her first husband was Dorey F. Robinette (1895- ? ), son of Harrison and Mary Frances (Bucy) Robinette and grandson of Hanson and Mary (Dunn) Bucy. They obtained their marriage license on Aug. 30, 1915, in Cumberland, MD. At the time, Dory lived in Cumberland and Estella in Cresaptown, MD. 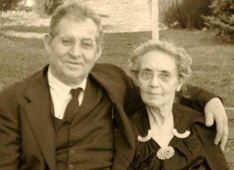 They had children -- John F. Robinette and Lena Robinette. 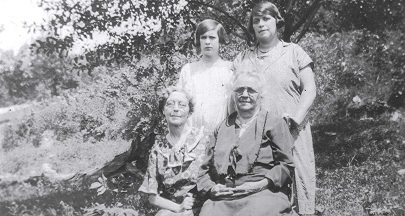 When the federal census count was made in 1920, Dory and Estella made their home in Cumberland, Allegany County, MD. Dory earned a living that year as a fireman and stationery engineer. After the Robinettes' marriage ended, one or more of the children are said to have been raised by their paternal grandmother Bucy. Dorey moved to Buck Valley, Fulton County, PA, where he made his home in 1961. The name of Estella's second spouse was Edward Hagerty (1874- ? ). They were 26 years apart in age. Edward was a building carpenter, and they lived in Savannah, Chatham County, GA. They remained in Savannah at least through 1947 and perhaps longer. Her third husband was (?) Dixon. She passed away of cancer on March 26, 1954. Nothing more is known. Son John F. Robinette (1916- ? ) was born on June 13, 1916 in Maryland. During World War II, he served as a private in the U.S. Army. Circa 1961, he made his home at Warner Robins, GA. He is believed to have married Julia Ann (?) (1922-2009), a native of Laurens County. GA. Initially they lived in Warner Robins. They had three known children -- Roy A. Robinette, Martha Hilton and Cindy Robinette. In about 1968, they relocated to Badenton, Manatee County, FL. Evidence suggests that John died in Bradenton on March 22, 1990, at the age of 73, with interment at Bay Pines National Cemetery. Julia survived her husband by 19 years. She died in Bradenton at the age of 87 on Feb. 20, 2009. Her obituary was published in the Dublin (GA) Courier Herald and the Bradenton Herald Tribune. Their daughter Cindy provided photo images and information for this website in the early 2000s. Daughter Lena Robinette (1918- ? ) was born in about 1918 in Maryland. She wed Riley Brisco Payne ( ? - ? ). In 1943, the couple purchased a house lot on Williams Road in Cumberland from Lena's grandmother, Mary Frances Robinette, for the sum of $100. In 1961, they lived at 975 Williams Road in Cumberland, and the grandmother died in their home that year. 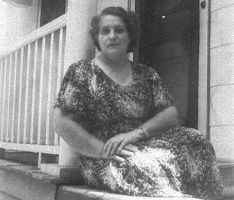 Daughter Laura "Ruth" Williams (1901-1971) was born on Dec. 10, 1901 in Frostburg, Allegany County, MD. She grew up near Ohio Pyle, Fayette County, PA and then migrated with her parents to Allenport, Huntingdon County in the 1910s. She married Moses F. Moist (1891-1952). They lived for many years in Newton Hamilton, Mifflin County. The Moists had seven children -- Esther Harshbarger, Charles Franklin Moist, Chester C. Moist, James Moist, Lester R. Moist, John E. Moist and Moses F. Moist Jr.
Over the years, Ruth was a member of the Newton-Wayne Fire Company Ladies Auxiliary. She suffered from cancer and died at the age of 69 in Huntingdon's J.C. Blair Memorial Hospital on April 29, 1971. Funeral services were led by Rev. Harry Krause, followed by interment in Mount Union IOOF Cemetery. The Huntingdon Daily News reported that she was survived by 16 grandchildren and five great-grandchildren. Daughter Esther E. Moist (1919-2000) was born on Nov. 25, 1919. She married Bruce Harshbarger ( ? - ? ). Their home in 1971-2000 was in Newton Hamilton, Mifflin County. Esther passed away on Sept. 20, 2000. Son Charles Franklin Moist (1923- ? ) served in the U.S. Armed Forces in World War II. He lived in the early 1970s in McVeytown, Mifflin County. Son Chester C. Moist (1925-2003) was born on Nov. 29, 1925. He resided in Mount Union circa 1971-2003. He died on April 22, 2003. Son James E. Moist (1927-2007) was born on June 6, 1927. He made his home in Tyrone, Blair County. He died on June 6, 2007. Son Lester R. Moist (1929-2007) was born on April 14, 1929. He lived in Elizabethtown, Lancaster County. He died on April 18, 2007, just four days after his 78th birthday. Son John E. Moist (1929-2006) was born on Jan. 25, 1929. He resided in Newton Hamilton. He died in or near McVeytown, Mifflin County on Nov. 13, 2006. Son Moses F. Moist Jr. (1937-2002) was born on May 10, 1937. He made his residence in 1971 in Mapleton, Huntingdon County. He died on June 10, 2002. Son Charles Henry Williams (1904-1967) was born on Feb. 29, 1904, Leap Day, in or near Stewart Township, Fayette County. As an adolescent he migrated with his parents and siblings to Huntingdon County, PA. He married Emma Charlotte Carter (1907- ? ) in about 1923, when he was age 20 and she 18. She was the daughter of William and Margaret Carter. The Williams and Carter families were close, and Charles' sister Marella married Emma's brother Clinton Carter. They had six known children, and perhaps more -- Charles Junior Williams, Sherman Williams, William D. Williams, James L. Williams, Betty M. Williams and one other. In the eyes of an editor with the local newspaper, the Huntingdon Daily News, the Williams children enjoyed a rare benefit of having 10 living grandparents in four generations. The article appearing in the May 12, 1927 issue listed the names: "four grandparents, Charles J. and Laura J. Williams and William and Margaret Carter. The six great-grand parents are Leroy and Hester Williams, Charles Walter and Martha Gorsuch and John and Margaret Bond." Charles and Emma resided for many years in Mount Union after moving from Oakdale in November 1930. In 1930, the federal census enumeration shows the family residing next to Charles' parents in Shirley Township, Huntington County. Charles' occupation that year was "bridge building" on the state road. He also worked in a pin mill, making wooden pins onto which glass insulators were threaded, used on the old style telephone pole cross beams. Charles died of a heart attack in 1967, at the age of 63. Son Charles Junior Williams. (1924- ? ) was born in 1924. Son Sherman Williams (1925- ? ) was born in 1925. He was married and resided in Mount Union. They had one known son, Andrew G. Williams, who served in the U.S. Coast Guard during the Vietnam War. Son William D. Williams (1926- ? ) was born in 1926. Son James L. Williams (1927- ? ) was born in 1927. Daughter Betty Mae Williams (1928- ? ) was born in 1928. Daughter Marella Irene Williams (1906-1994) was born on March 23, 1906, in Dunbar, Fayette County. She married Clinton H. Carter ( ? - ? ). He was the son of William and Margaret Carter. The Williams and Carter families were close, and Marella's brother Charles married Clinton's sister Emma Charlotte Carter. They had at least four children, Robert Vernon Carter, Irene Carter, Emma Leone Gaff Wiktor and Edna Carter. They resided in Otelia, PA in 1928; and in Licking Creek, Mount Union, Huntingdon County in 1944-1971. Marella was active with the Friendship Class of the Mount Union Presbyterian Church, and served as its president in the 1960s. Clinton was appointed as Junior General Mechanic for Civil Aeronautics Authority by the U.S. Civil Service Commission. In September 1940, he left for Newark, NJ, for a job that required him to travel between Maine and Virginia. At the time, said the Daily News, the family was "living in one of the commodious log buildings at the C.C.C. Camp where for the present his family will remain." In 1944, Clinton secured employment in Barre, Vermont and upstate New York as an airways technician. In June of that year, son Robert traveled there to spend the summer with his father, and lived on a farm on Lake Champlain in Ticonderoga, NY during that time. He continued to live on the farm in late 1944 and early 1945. At one point Emma planned and built a log cabin. She contracted out for plumbing and electrical services, and had assistance for setting the logs, but otherwise did all of the work herself. She once hosted a visit to the cabin from her aged grandmother, Martha (Minerd) Gorsuch, where a photo of the event was taken, showing Martha seated in a comfortable stuffed chair. The structure measured 28 feet by 30 feet and featured four rooms, bath, electric range, cupboards, and oil heating unit and "never failing water." During World War II, Emma worried as her son Robert served in the U.S. Armed Forces. His enlistment period continued well after the war's end, and in 1948 was part of the German occupation forces. That year, he broke his arm, and was hospitalized in Frankfurt. In September 1948, while in Austria, he telephoned his mother and had an enjoyable conversation. The Huntingdon Daily News reported that "It had been almost two years since Mrs. Carter had heard the voice of her son and she says it was as natural and clear as though he were in the same room with her." In the early months of 1957, Marella and Florence Miller of Mount Union made an "an extensive tour of Florida and other southern states," said the Daily News. "The ladies left Mount Union two months ago and spent about six weeks in the vicinity of Kissimmee. During that time they motored extensively and visited many places of interest." Clinton met up with the women and they drove back home together. Marella and grandson Bruce Joseph Carter were injured in July 1960 when the 1960 Chevrolet Corvair she was driving struck a truck in Mount Union borough. She suffered broken ribs while the child endured head and face fractures. On Jan. 11, 1994, Marella passed away in Mount Union. Son Robert Vernon Carter was born on July 26, 1928. He served with the U.S. Army during World War II, and re-enlisted for service in Asia during the Korean War. He was assigned to Company B of the 1092 Combat Engineers group. He married Irene (?) and lived on Licking Creek Drive in Mount Union. They had at least one son, Bruce Joseph Carter, who served in the U.S. Navy during the Vietnam War aboard the aircraft carrier USS Kennedy, deployed with the Sixth Fleet. After Robert and Irene divorced, she married a man named Hartley, and lived in Florida. Daughter Emma Carter (1930-1982) was born on Aug. 12, 1930. She was twice married. Her first husband was Merrill Gaff ( ? - ? ). They had one son, William Gaff. Later, after a divorce, Emma wed Chester Wiktor. They resided in Columbus, Franklin County, OH, where Chester served as a technical sergeant in the U.S. Air Force. Chester adopted Emma's son as his own, and the child took the name "William Wiktor." They had several known children of their own, among them Timothy Michael Wiktor and Denise Wiktor. Sadly, son William, of Canton, Stark County, OH, died in 1979. Emma was not close with her siblings and in about 1961 is said to have "cut all ties" except with one sister. In poor health, she was treated at Walter Reed Army Hospital in the District of Columbia. She died in Baltimore in June 1983, at the age of 52. Grandson William Gaff Wiktor (1948-1979) was born on Jan. 31, 1948. He served in the U.S. Armed Forces during the Vietnam War. After the war, he lived in Orbisonia, Huntington County. He died there in August 1979, at the age of 31. Son John Alvah Williams (1908-1966) was born on May 6, 1908 in Maryland. On Feb. 9, 1928, at the age of 20, John married Anna M. Anderson ( ? - ? ). Rev. R.S. Burris oversaw the nuptials. John and Anna had two daughters -- Frances Miller and Anna Lou Mentzer. 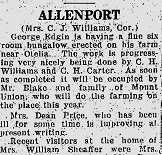 They resided for many years in Allenport, Huntingdon County. In 1966, he worked for E.F. Goetz Construction Company of Chambersburg, Franklin County. Sadly, John died at home of a heart attack on June 10, 1966. Following a funeral held in the home, led by Rev. Harold Ash, John was laid to rest in Haven Rest Park in Mount Union. A lengthy obituary was published in the Huntingdon Daily News. Daughter Frances Williams married Jack Miller. They resided in Hammond, IN and had one son, Walter Miller. Daughter Anna Lou Williams married Kenneth Mentzer. Their home in 1966 was in Valley Lee, MD. They had two children, Susan Mentzer and Kenneth Mentzer. Son William "Edward' Williams (1914-1970) was born in 1914 in Maryland. At age 16, Edward and his older brother Charles had jobs in the Wiley Mill in Hill Valley, about a mile from Mount Union. They narrowly avoided tragedy in a vehicular accident involving their Ford truck. While driving in Hill Valley, the truck skidded down a 50-foot embankment and flipped three times. Following behind in another automobile were their father and brother in law Clinton Carter, who stopped and help rescue the ill-fated men. Said the Daily News, "Both of the young men were painfully bruised and cut and escaped death miraculously." During the Great Depression, during the winter of 1936, he worked for the Civilian Conservation Corps (CCC) at Carlisle, PA. Upon learning in September 1937 that his uncle Frank Zearfoss had been killed in a Somerset County coal mine accident, he immediately left home to be with his newly widowed aunt in Stoyestown, Somerset County. He then went on to the home of his mother's married cousin, Mary and Walter Malone, in Ruffsdale, Fayette County. In June and July of 1938, he spent three weeks in Chicago visiting his uncle R.H. Williams. In August 1943, he is known to have traveled to Youngwood, Westmoreland County, PA to spend more than a week visiting his brother Andrew and other Minerd cousins. In 1966, his home was in Mechanicsburg, Cumberland County, and in 1971, he lived at Camp Hill, Cumberland County, PA. He died in 1970 after suffering a heart attack. Son Andrew Norris Williams (1915-1980) was born on April 21, 1915 in Maryland. He grew up in the vicinity of Ohio Pyle, Fayette County, PA and later in Allenport, Huntingdon County, PA.
As a young man, in May 1936, he secured employment in the Atlantic and Pacific (A&P) Company Store located on Shirley Street in Allenport. At the age of 22, on Aug. 14, 1937, Andrew married Gladys Jean Sherman, daughter of Emma C. Sherman of Youngwood, Westmoreland County, PA. Rev. John Strayer, of the Youngwood United Brethren Church, officiated at the ceremony, held at the Sherman residence. The couple likely met during one of Andrew's visits with relatives who lived there. They had three known children, among them Carole Lee Williams, Barry Dean Williams and Andrea Jean Williams. They resided in Youngwood, where they were close with Andrew's cousins Ernest Earl and Edith (Erwin) Minerd and Arnold and Violet Grace (Erwin) Overholt and their children. Despite being 115 miles away from his parents and family, Andrew often traveled back to Allenport for visits over the years. Andrew's wife was ill in the summer of 1943 and spent more than a month in Johns Hopkins Hospital in Baltimore. He was in Youngwood circa 1966-1971. He may be the same Andrew Williams who, in June 1970, helped organize the annual Forbed District Campree of the Westmoreland-Fayette Council of the Boy Scouts of America, held at Twin Lakes County Park. More than 500 boy and 75 adults were expected to take part, estimated the Daily Courier: "Competition will be in scoutcraft, covering knot tieing, nature identification, lighting a fire, first aid and communications, and fitness covering rope climbing, broad jump, pushups and pull-ups." As with several of his siblings, he died of a heart attack, at the age of 65, on Oct. 5, 1980.